The anticipation for Peak cherry blossom season is great. The predication of the cherry blossom season has just been revised, looks like this pleasant, warm weather is helping those blooms to spring to life. NPS is now predicting the peak bloom to be between March 18 -23. This is significantly earlier than the historical average of April 4th. Predictions are hard to pinpoint and horticulturalists can’t be really confident until about 10 days out. Peak bloom is considered to be when 70 percent of flowers are out. There are still many days before and after that would be considered a sight to behold. 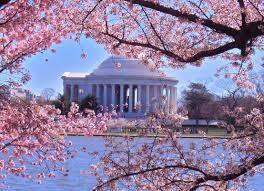 Cherry blossom season in Washington, DC is a very popular event, and is visited by many tourists and locals. Most events and locations advise of the limited amount of parking. Make your plans ahead of time, but advice is to get there by alternate means. One of the ways to enjoy the festival and all it has to offer is by using a car service to get there. Don’t hassle with metro or parking, use a limousine or sedan service to allow for full enjoyment of this spectacular season. ICS Limousine has competitive offers on services for any group size. So whether it is for you and your loved one, or a large group we will be able to provide transportation for you and yours. Check out the cherry blossom forecast for peak cherry blossom viewing at the National Park Service Bloom Watch. 2016 National Cherry Blossom Festival takes place from March 20 through April 17. March 18 – 7 p.m. to 11 p.m.
—mark the end of winter by attending this event to welcome in the spring season. Enjoy delicious food, unique entertainment and silent auction. March 26 – 5 p.m. to 6:30 p.m.
Tickets: Free, advance ticketing required. — a free event that includes traditional and contemporary performances from American and Japanese artists. March 26 – 9 a.m. to 5 p.m.
—National Building Museum activities include origami, designing a memorial for the National Mall, constructing a tatebanko diorama, meeting DuAro, and trying on traditional Japanese clothing. April 2 – 10 a.m. to 4:30 p.m.
April 9, 2016 – 1 p.m. – 9 p.m.
—eight hours of free music, family friendly water-related activities, cultural experiences, live entertainment and delicious foods at multiple outdoor venues. Fireworks display 8:30pm. There is no public event parking on Water Street, SW.
April 16 – 10 a.m. to 12 p.m.
—energy-filled National Cherry Blossom Festival Parade® presented by Events DC. Giant colorful helium balloons, elaborate floats, marching bands from across the country, celebrity entertainers, and performers. April 16, 2016 – 10:30 a.m. to 6 p.m.
—largest one-day celebration of Japanese culture in the U.S. Held the same day as the Parade, this rain-or-shine event brings vibrant performances to four stages. Sakura Matsuri welcomes more than 80 cultural groups, arts vendors and food booths to our celebration. April 16, 2016 – 6 p.m. to 2 a.m.
—a vibrant combination of Japanese sights sounds and tastes, bringing the energy and excitement surrounding its pop cultural experiences to the Festival. This year the event creatively spotlights all things related to anime, cosplay and gaming.